Elicit grace in this long mocha prom dress. 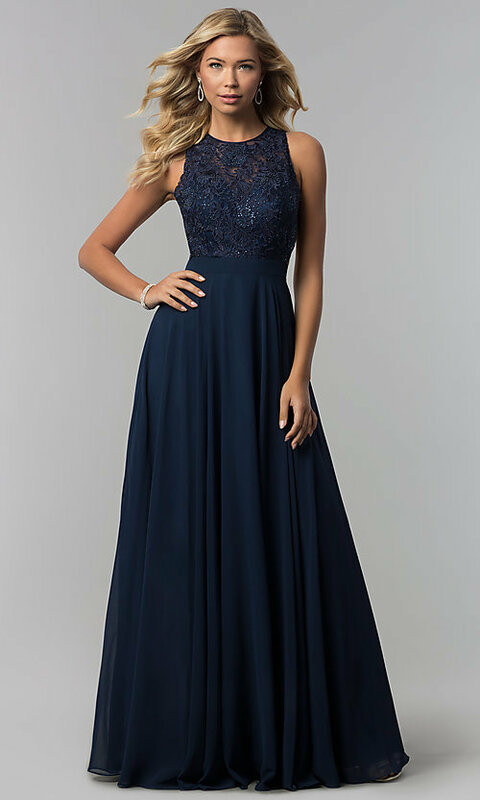 With a design that says, "sophistication," in any formal venue, this floor-length evening dress features an embroidered-lace bodice and a gorgeous chiffon skirt. Floral designs in the mauve purple lace gleam from the scoop neckline down to the natural waistline and frame a bold back cut out. With a yoke forming the shape of a bow around the back of the shoulders, the triangular cut out crowns the long chiffon skirt that extends to the sides to give the bodice a cut-in shape. A high neckline offers the right touch of modesty to balance the flirty cut out and completes the long mocha prom dress fashionably. The model wearing burgundy is 5'9.5" and wearing 6" heels.